Conserve energy with these 2-watt LED bulbs (15 in all) made of durable glass to lend a classy restaurant look and feel. (For replacement bulbs please search for B01IQIUYU8 at Amazon.com) The vintage design with charmingly retro exposed filaments provides light bright enough to enjoy al fresco dining after dark, but at 2,700k they're still very gentle on the eyes and environment. Tether up to 40 strands together with nothing else needed to connect additional sets as they plug into one another, end to end. Lights may be attached to a dimmer for greater versatility in mood lighting. We recommend using the Lutron TTCL-100H-BL Credenza Dimmer. LUMINOUS DÉCOR FOR ANY OCCASION - Bathe your patio, garden, or pergola in a warm glow to set the mood for an evening of fun and laughter outdoors. These dimmable, 2,700K heavy duty LED string lights will cast a spell over neighbors and friends at evening events such as birthday parties, family reunions, or wedding receptions. Mesmerize your guests with the nostalgic aura of the exposed Edison style bulb filaments. Ambience Pro makes your backyard feel more like a splendid outdoor café! 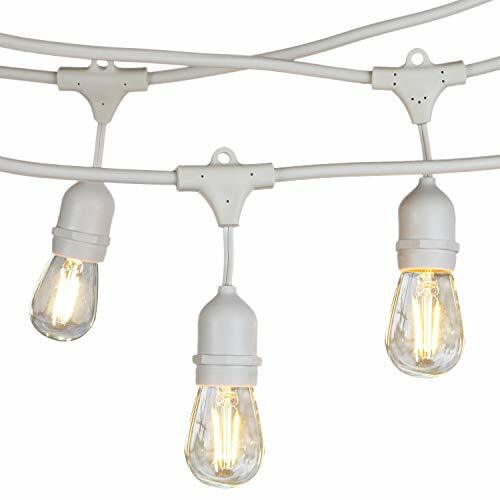 ENERGY EFFICIENT WEATHERPROOF LIGHTS - Connect up to 8 strands end to end, then customize arrangements from tree to tree or in a cluster thanks to the ample distance between the high efficiency Edison bulbs. Convenient loop on each socket allows for easy installation using eye hooks, zip ties, or 16-gauge guide wire (1/8 or 3mm diameter available at home improvement/hardware stores). To keep multiple strands together across a long distance, use electrical tape to secure the plug connections. INCLUDES 15 HIGH EFFECIENCY LED STANDARD BASE 2-WATT BULBS - 30 watts in total saves more money on your power bill than if you were using incandescent light bulbs. These LED lights are approved for residential as well as commercial lighting plus they NEVER get hot, not even after burning for hours. UL Listed for Outdoor Use. The Lutron TTCL-100H-BL Credenza Dimmer works great to dim these bulbs for more versatile lighting.